What Ann Brashares possibly didn’t know when she wrote the Traveling Pants series was that there would be thousands of girls out there desperate to become the 5th member of the Sisterhood. Though I was a few years older than Tibby, Bree, Lena, and Carmen when the series first became published, I loved each girl and recognized how special and sacred their friendships with each other are. Too many books for teenage girls are about boyfriend stealing, cheating, backstabbing, and toxic friendships. Ann Brashares’ books are a celebration of friendship, of the bonds that young women form and how they shape them for the rest of their lives. The Sisterhood has made me desire friendships like what these young ladies had more than even true love. Forever Blue (2007) seemed to be the last in the series, but fans returned to the home of the legendary pants in 3 Willows (2009). Now girls who grew up with this series will be reunited with Tibby, Bree, Lena, and Carmen 10 years after Forever Blue ended. The girls, women who are now nearing 30, have drifted apart over the years. Tibby and Brian moved to Australia, Carmen is a successful actress living in New York with her fiancé, Bee and Eric are still together living in New York, and Lena is a teacher in a comfortable relationship with Drew. After what seems like years of silence, Tibby mails a plane ticket to each of her friends so they can reconnect in Greece, the home of Lena’s now deceased grandparents. They arrive, not knowing that their reunion will change the course of their lives forever. 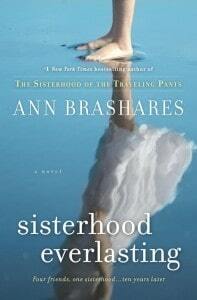 Some may be hesitant to pick up Sisterhood Everlasting, fearing that this book will somehow ruin the original series. Having been unable to put down the book until I finished it, I felt that Brashares treated her characters fairly. That’s not to say that each of them didn’t break my heart one way or another as I quickly turned the pages, but I believe that each of them ended where she was meant to be. At the end of Forever Blue, I wanted their story to go on. I want the same after reading Sisterhood Everlasting; I’m still not ready to say good-bye to these amazing girls. There are stories still left to be told, and I hope that Brashares will continue this fantastic saga. I thought it was a good continuation of the series, but having only read the first couple of books in the series I wasn’t as attached to the characters as I’m sure others are. I was curious to see what long-time fans thought as well. It’s nice to see that you liked the book too (and I agree there was definitely heartbreak). This sounds like a fabulous book. I haven’t read the others, but I might have to so I can enjoy this one.